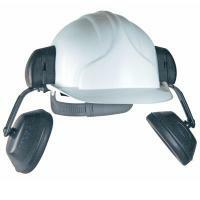 Surefit hard hat with attached ear defenders. 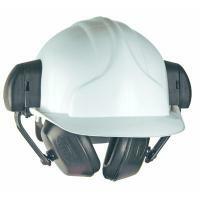 Fit securely on to the JSP safety helmet. Ear muffs come with stand-off positioning. H=31, M=23, L=16, SNR=26, EN352-3. For use with MK 2/3 helmets. The new Surefit™ ear defender attachments have been designed specifically for use with the new Invincible® Mk VI® and VII® safety helmet hard hat. They incorporate a spring loaded stand off function which allows them to press firmly to the head and create a good against noise seal. The universal slot enables a very firm fitting of the ear defender adaptor blade that grips the safety helmet shell and retention is further enhanced by a clip, which may be optionally added to the underside of the hard hat to give extremely firm retention for harsher environments.